May Ayim was one of the most influential founding figures of Afro-Deutsch studies in Germany. Born to a German mother and Ghanian father in 1960, she grew up in a white foster family in Germany. Her experience was not unusual: others Afro-German authors, like Ika Hügel-Marshall, who spent most of her childhood in a home for children, grew up in environments which estranged them from their African roots, as Tina Campt explores in her monograph Other Germans. Hügel-Marshall’s memoir Daheim Unterwegs exposes what it was like for many members of this generation, and Ayim’s poetry and scholarly works thematize and problematize the situation many Afro-German women faced daily. Ayim, who went by the name May Opitz until 1992 when she began using her father’s name, worked closely with Dagmar Schultz and Audre Lorde (also mentors of Hügel-Marshall). She was active in both feminist and Afro-German movements, and started the Initiative Schwarz Deutsch in 1986, the same year that Farbe Bekennen: Afro-deutsche Frauen auf den Spuren ihrer Geschichte was published. Later translated into English as Showing Our Colors: Afro-German Women Speak Out, Ayim contribued to and edited Farbe Bekennen along with Schultz and Katharina Oguntoye, and this volume is universally accepted as the first published use of the term Afro-Deutsch. Ayim later helped edit Entfernte Verbindungen: Rassismus, Antisemitismus, Klassenunterdruckung (1993). Letters, interviews, essays and conversations collected in Grenzenlos und Unverschämt, published in 2002 after Ayim’s suicide in 1996, discuss directly how influential the black German community was in shaping Ayim’s understanding of herself and her place in society, especially in realizing she was not alone and finally finding a sense of belonging. Her poetry explores these topics as well, examining and drawing connections to her African heritage as well as directly confronting German racism and microaggressions through language. 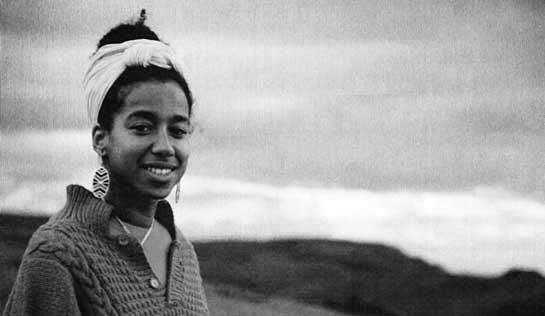 In her collection of poetry from 1996 is titled Blues in Schwarz Weiss, playing on her bilingualism (as English was the language she shared with her father), as well as a larger connection to a global African diaspora through the invocation of the musical tradition the blues. Ela Gezen analyses the musicality of Ayim’s poetry, as well as the oral tradition present in her writings, which Ayim herself claimed as an important influence in interviews. Also deeply embedded in the collection is a sense of community: the poems are dedicated to people close to Ayim, and one poem, titled “Community” pays homage to significant figures in the history of the African diaspora as well as other oppressed minorities across the world, including Sojourner Truth, Mohatma Ghandi, and Anton Wilhelm Amo. Ayim’s poetry demonstrates the important malleability of language and its power to both give and take from marginalized peoples. In “Soul Sister,” for example, Ayim reflects on establishing the term “Afro-Deutsch” with Audre Lorde, whose name appears in capitalized letters while all other rules of punctuation are absent. In simple but powerful terms, Ayim shares the experience of finally finding a sense of ownership over her own identity, which had previously always been ascribed to her by members of the dominant German culture. Her poem “freiheit der kunst” captures one such an exchange in an artistic treatment of a conversation between two female authors, in which Frau K. tells Frau S. that though words like “neger” or “mulatte” may be an insult for her (Frau S.), Frau K. instead thinks that “für mich klingen solche worte/melodisch und klassisch/ greifbar sinnlich statt unnahbar sachlich”, ending her letter with the claim that “einer meiner texte heißt/”ausländer rein”/ich kann also nicht/rassisstisch sein…/ (Ayim 76). It’s almost shocking how such poetry written by an Afro-German woman in 1996 is still so relevant in 2017, given that such statements are still made publicly in defense of indefensible acts, such as most recently by the mother of the white nationalist who drove his car into a crowd of protestors in Charlottesville, VA, killing one and injuring 19 more. Before her tragic, untimely death in 1996 after her diagnosis of multiple sclerosis and subsequent suicide, Ayim was using the written and spoken word to give voice to a generation of marginalized Afro-Germans who had grown up in white families, foster homes, and orphanages, disconnected and isolated from a larger cultural identity. Ayim not only advanced the rights and representation of marginalized African communities in Germany, more importantly, both her scholarly work and her poetry brought together people and especially women of color within the margins for the first time. Campt, Tina. Other Germans: Black Germans and the Politics of Race, Gender, and Memory in the Third Reich. University of Michigan Press, 2005. Gezen, Ela. “May Ayim Und Der Blues.” Monatshefte 108.2 (2016): 247-58. Michaels, Jennifer. “‘Fuhlst Du Dich Als Deutsche Oder Als Afrikanerin?’: May Ayim’s Search for an Afro-German Identity in Her Poetry and Essays. (Author Abstract).” German Life and Letters 59.4 (2006): 500-514.